The store manager at Wukro Hospital uses the HCMIS to check the hospital’s stock status and produce reports that help him determine how much stock to order. Having the right product at the right time is crucial for patient care. However, in Wukro Hospital, located 800 km north of Addis Ababa in Ethiopia’s Tigray region, availability of essential medicines and other vital health supplies was a major challenge for many years. Patients were often forced to look for their prescribed medicines outside the hospital in private pharmacies, where they were often not available, or available only at prohibitive prices. Witnessing this on a daily basis was very frustrating, says Dr. Mehari Desalegn, medical director of Wukro Hospital. According to Dr. Mehari, availability of essential medicines was less than 40 percent at the hospital. At the same time, products worth more than 400,000 ETB (approximately U.S. $20,000) were wasted each year due to damage or expiry. The lack of availability of logistics data, including stock status and consumption, was a significant contributor to this. The hospital management and the regional health bureau (RHB) decided that action was needed to meet performance standards set by the Federal Ministry of Health (FMOH), including increasing the availability of medicines to patients. As part of this effort, the hospital—with support from the RHB, the Pharmaceutical Fund and Supply Agency (PFSA), and the USAID | DELIVER PROJECT (the project)—started implementing the Health Commodity Management Information System (HCMIS) in 2008, becoming the first in the country to pilot and fully implement this innovative inventory management system. The changes in the store and in the logistics system have improved product management practices and decreased costs incurred because of overstock and expiries. The HCMIS is a user-friendly software package that helps health facilities to manage all essential medicines, as well as medical and laboratory supplies. Facilities enter all items received and issued into the system, along with batch numbers and expiry dates. The system allows increased data visibility into stock on hand, and ensures proper stock rotation through FEFO (first-to-expire, first-out). The system manages inventory and produces a variety of commodity reports for store managers, pharmacists, and facility heads.The software was developed locally to ensure sustainability and readily available assistance when changes or modifications are needed. Prior to system implementation, the project provided technical support to reorganize the physical storage and improve the paper-based inventory management and internal reporting system. The project also supplied computers, printers, and other accessories for the HCMIS, and staff received intensive training and on-going technical support on how to use the system. 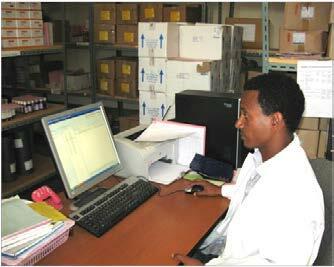 “Since implementing HCMIS, our pharmacy hasn't been the same,” says Dr. Mehari. As a result of HCMIS, the pharmacy department has been able to provide real-time and accurate logistics information— including average monthly consumption, stock on hand, and near-to-expire products—to the hospital management and clinicians for decisionmaking. The management uses the information to improve inventory management practices and to decide how much and when to procure pharmaceuticals. 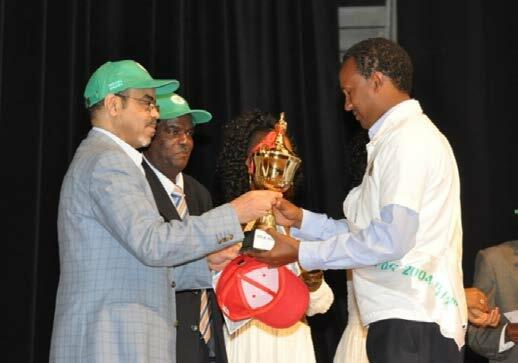 Dr. Mehari Desalegn receives an award from the late Prime Minister Meles Zenawi for improved performance in service provision and hospital management. Over the past five years, Dr. Mehari says availability of essential medicines in the hospital has increased to more than 90 percent. Annual losses stemming from wastage and expiry have been reduced to less than 50,000 ETB (about U.S.$2,600). While many factors have contributed to this, Dr. Mehari is convinced that the HCMIS is a crucial factor. Currently, the hospital serves more than 55,000 patients with about 2,500 admissions annually. Providing life-saving services to large numbers of patients is a challenging task unless supported by innovative technologies like HCMIS, adds Dr. Mehari. Now, patients can get their medicines in the hospital, at affordable prices. The hospital has received recognition and awards from the RHB, the FMOH, and from international partners for its achievements—all of which would be impossible without the commitment of the hospital staff and the support of the RHB and PFSA. Using the experiences from Wukro Hospital, the project has expanded the implementation of the system to nearly 400 hospitals and larger health centers throughout Ethiopia. PFSA recognizes the value of the system, and has procured computers, printers, and other hardware to support continued expansion. 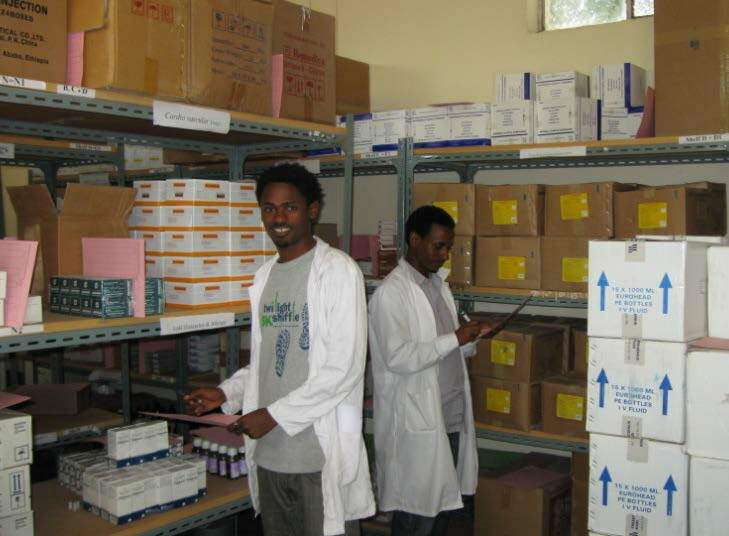 Ethiopia is a pioneer in automation of inventory management in health facilities and it all began five years ago in Wukro, thanks to the vision of Dr. Mehari and the Tigray RHB and PFSA.